The recipients of the ACS Rubber Division awards, given out at the 2018 Science & Technology Awards Banquet are, from left: Steven Smith of Procter and Gamble, Melvin Mooney Award for Distinguished Technology; Eric Baer, of Case Western Reserve University, Charles Goodyear Medal; Megan Robertson of the University of Houston, Sparks-Thomas Award; Joey Mead of the University of Massachusetts Lowell, George Stafford Whitby Award for Distinguished Teaching & Research; and Reinhold Kipscholl of Coesfeld GmbH & Co. K.G., Fernley H. Banbury Award. Not shown is Joesph Padovan, recipient of the Melvin Mooney Distinguished Technology Award, who was unable to travel to the meeting. 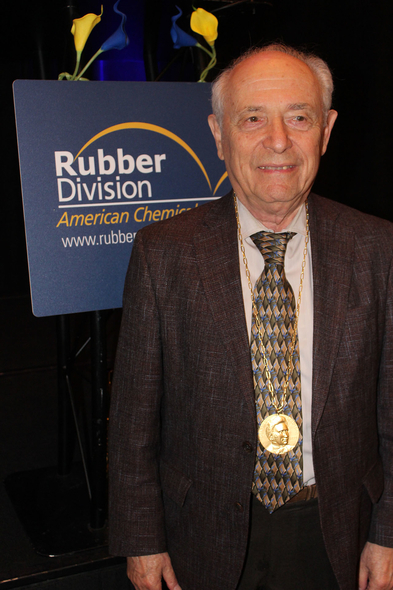 Eric Baer, a professor at Case Western Reserve University, received the Charles Goodyear Medal, the highest honor given out by the ACS Rubber Division. Jerry McCall (left) of R.D. 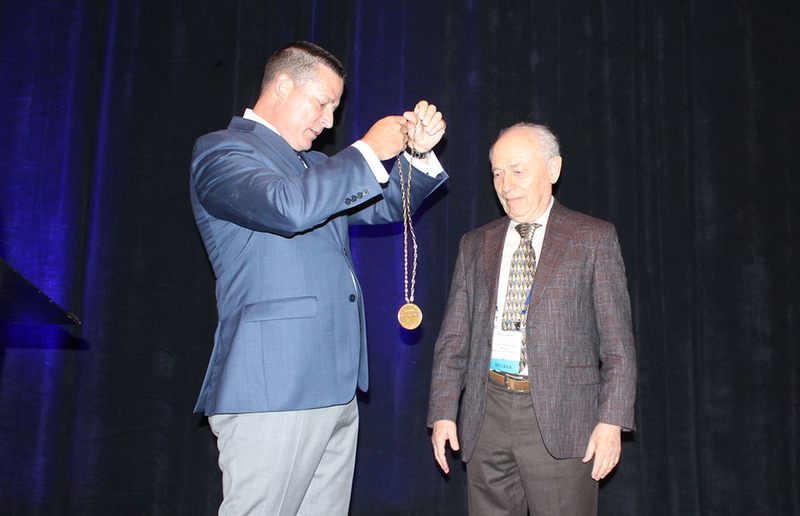 Abbott Co. Inc. and 2018 chair of the ACS Rubber Division, presents the Charles Goodyear Medal to recipient Eric Baer, a professor at Case Western Reserve University who has spent 58 years in academia. 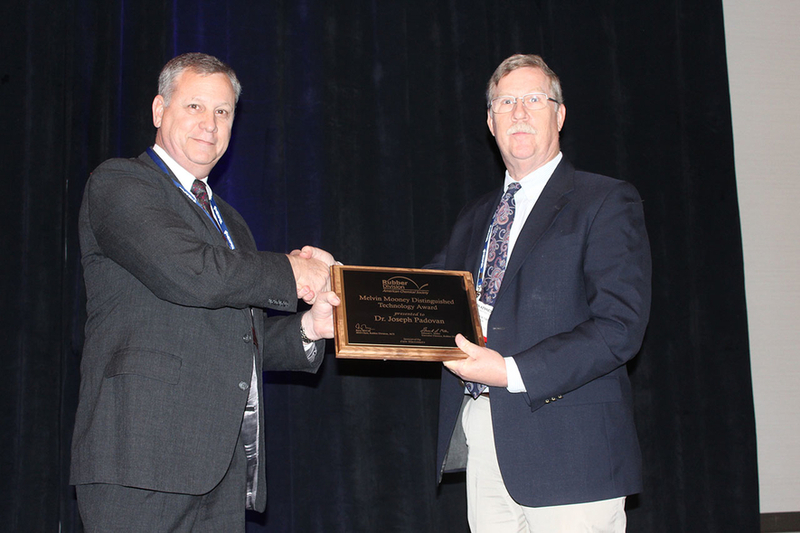 Will Mars (left) presents the Fernley H. Banbury Award to Reinhold Kipscholl of Coesfeld Gmbh & Co. K.G. in Germany. 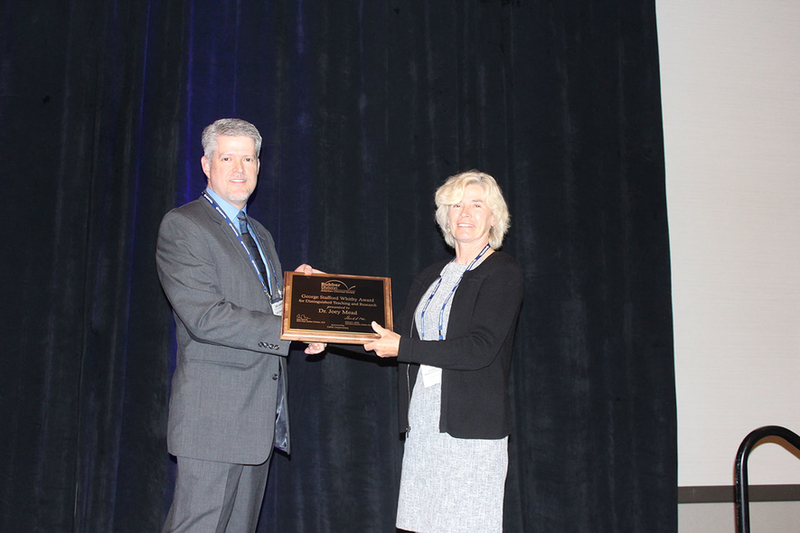 Chris Napier of ExxonMobil presents the Sparks-Thomas Award to Megan Robertson of the University of Houston. The award recognizes the efforts of younger scientists. Joey Mead, a professor at the University of Massachusetts Lowell, receives the George Stafford Whitby Award for Distinguished Teaching & Research from presenter Earl Harris of Cabot Corp.
Jim Lockhard (left) of Lion Elastomers presents the Melvin Mooney Distinguished Technology Award to Ron Kennedy, who accepted the award on behalf of Joseph Padovan of the University of Akron, who was too ill to travel to the meeting. 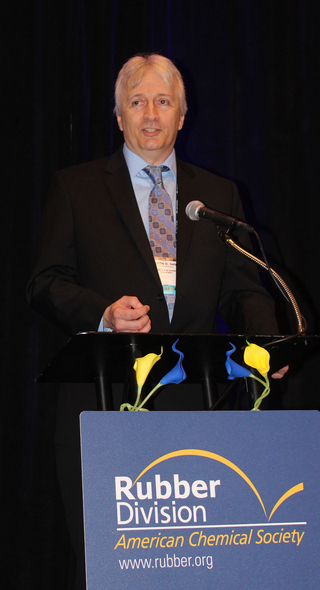 Steve Smith, a research fellow with Procter and Gamble, addresses the audience at the Science & Technology Awards Banquet after receiving the Chemistry of Thermoplastic Elastomers Award. 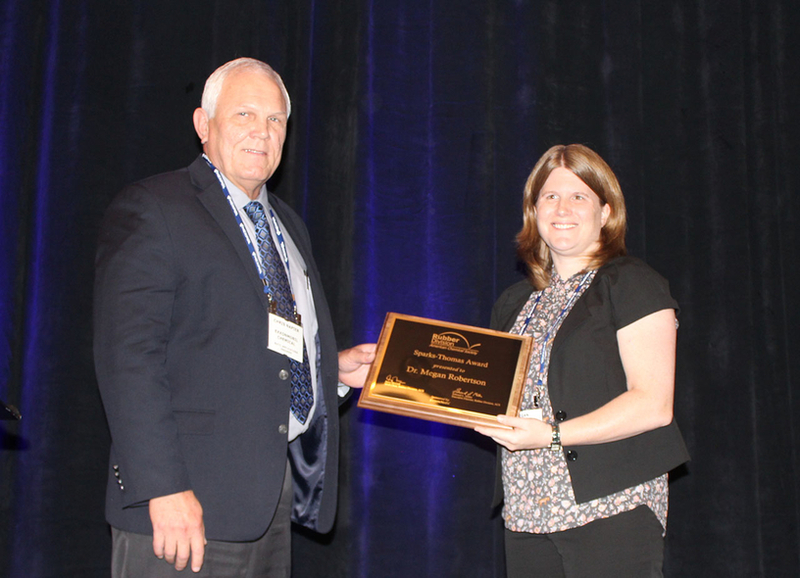 INDIANAPOLIS—The ACS Rubber Division gave its top awards May 9 during the 2018 Science & Technology Awards Banquet at its Spring Technical Meeting in Indianapolis. Eric Baer, a professor at Case Western Reserve University, was honored with the Charles Goodyear Medal, the technical association's highest honor. Other award recipients included: Steven Smith of Procter and Gamble, Melvin Mooney Award for Distinguished Technology; Megan Robertson of the University of Houston, Sparks-Thomas Award; Joey Mead of the University of Massachusetts Lowell, George Stafford Whitby Award for Distinguished Teaching & Research; and Reinhold Kipscholl of Coesfeld GmbH & Co. K.G., Fernley H. Banbury Award; and Joesph Padovan, Melvin Mooney Distinguished Technology Award. 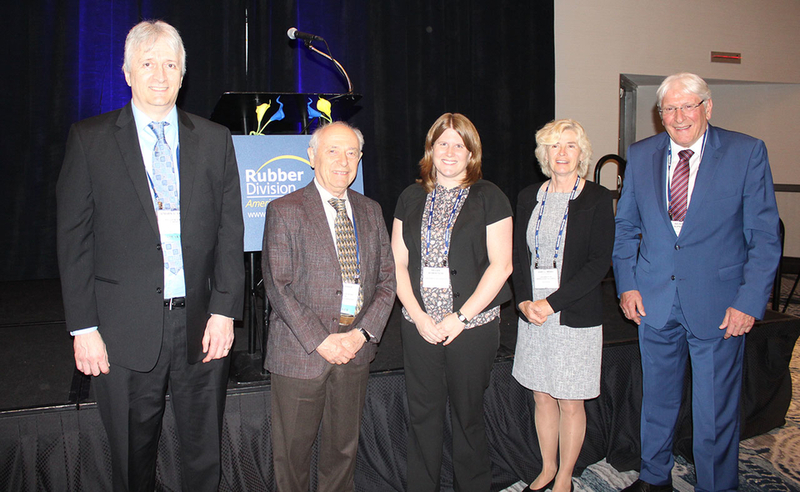 The Rubber Division is accepting nominations for next year's award winners until June 30. 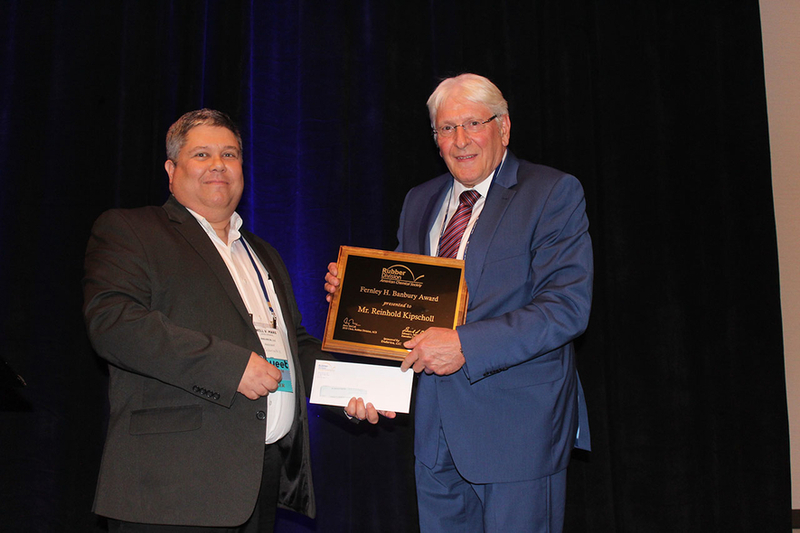 The winners will be announced during the International Elastomer Conference in October, and the awards given out at the 2019 Spring Technical Meeting in Independence, Ohio. For more information visit rubber.org.